Kaiju rampage in the micropolis of Tokyo! Between lack of LEGO time and an unsorted collection, I’ve been struggling with what to build for BrickCon — especially Big in Japan. 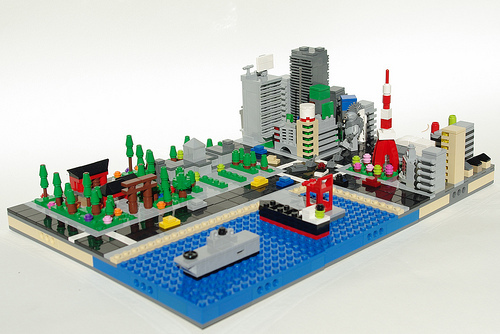 I wanted to build Tokyo Tower, a big Shinto shrine, Ginza, and the National Diet Building. My solution to build them all was to go microscale. Naturally, every Tokyo skyline needs a rampaging Godzilla-style monster, or kaiju. From the moment I saw the alien in the LEGO Star Wars set Freeco Speeder, I couldn’t help but thinking he would make a great kaiju. 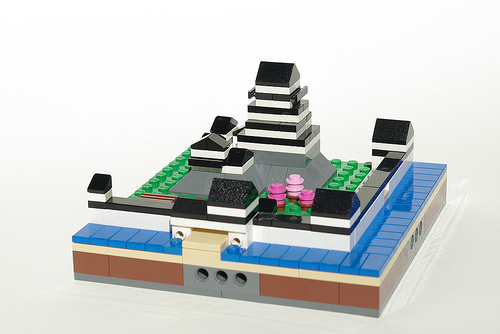 This was my first attempt at following the Micropolis Micro City Standard and gives me an opportunity to enter Reasonably Clever’s 2nd Micropolis Building Challenge (for which the deadline has been extended to July 24th, by the way). After I’d finished six standard Micropolis modules for Tokyo, I experimented with some non-standard, non-urban modules, and ended up with Himeji Castle. See more pictures in my photoset on Flickr.